It is the day before Christmas Eve. If you are in need of a gift for a fashion loving professional or future fashion business boss, you are in luck! The books in this post are perfect gifts for women who are working in, or entering, the business of fashion. Fashion lawyers and entrepreneurs already have a lot to digest for their crafts. 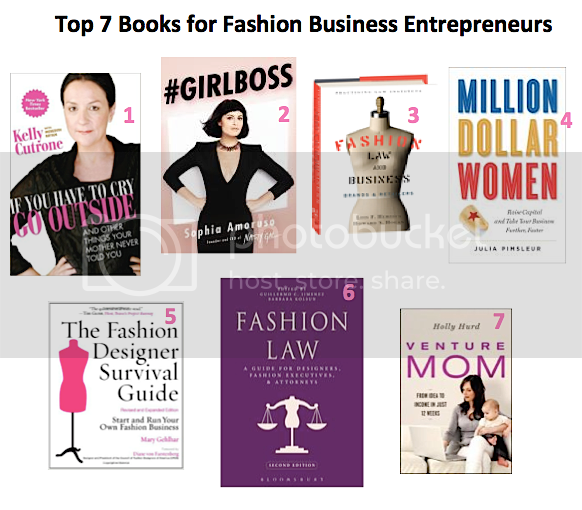 But the following seven books are perfect for women who want to be successful fashion bosses. You may know Kelly Cutrone as the tragically dressed and pale “ANTM” judge or boss of Lauren Conrad and Whitney Port on “The Hills” or “The City.” Or you may simply know her as the successful fashion publicist she is. Cutrone’s book follows her tumultuous rise from homelessness to the fashion elite. And I cannot help love a self-made woman. This realistic and pseudo rags-to-riches story can remind you that if you have time to read blogs, you also have the capability of making yourself a successful fashion boss. Aspiring fashion bosses can definitely use this book as a guide for navigating an alternative career path. Like Cutrone, Amoruso forged her own unique path to success: she started making money online by selling a stolen book. She then started and still heads Nasty Gal. Amoruso started her California based retail fashion business when she launched an ebay store in San Francisco, selling vintage clothing finds. The store was named Nasty Gal Vintage. She since grew her business into a company with more than 350 employees and worth more than $100 million. Amoruso reminds me of the type of cool girl who could star in Mean Girls without having to practice for the role. From the little I know, Amoruso seems to be proud, unfiltered, and unapologetically herself. Although she says she did not intend on starting her business to do any more than cover her rent and Starbucks, she is an amazing example of how an entrepreneur can become a multimillion-dollar fashion company. Even if your business is not focused on the millennial sect, Nasty Gal is an excellent example of developing a brand voice and cult following. Written by two of America’s leading fashion and retail law authorities, this book provides you with an integrated, comprehensive guide to the issues affecting the fashion industry today. This fashion law focused book provides guidance on the wide range of business issues faced by people and companies working in the business of fashion. Most women entrepreneurs are stuck at the ‘mom and pop’ level or in many cases, running out of cash. And while this must read is not a “get rich quick” book, Pimsleur shares how she raised millions in capital. She also introduces you to seven women who ditched their jobs and generated multimillion-dollar companies from scratch. Gehlhar is a consultant to hundreds of designers, including Zac Posen and Rebecca Taylor. Gehlhar’s book gives readers behind-the-scenes insights and essential business information on creating and sustaining a successful career as an independent designer. You do not need to intend on becoming a fashion designer to benefit from this book. Understanding the business side of fashion through the lens of a designer can help you develop a niche business idea. Like the other books on this list, this book is written to cover needs and topics present in the U.S. market. This fashion law focused book covers topics from the start-up phase all the way through international expansion. Updated to reflect recent legal decisions and regulatory developments, the book covers the principal legal disciplines that play a role in the life of a fashion company: intellectual property protection and litigation, licensing, anti-counterfeiting, start-up and finance, commercial transactions, employment regulations, advertising and marketing, celebrity endorsements, and custom and international trade. Editors Jimenez and Kolsun provide comprehensive legal information and guidance for students of fashion and law, fashion designers, fashion business executives, and lawyers specializing in fashion. Okay, so this book is intended for a niche market: entrepreneurial moms. But you can be a fur-mom or not responsibly for any lives other than your own and yet be as busy as a mom or even have a children’s based business idea. Venture Mom is good as a general guide and motivational tool for helping you build a business around something you love. The book is split into four easily digestible parts and contains a collection of inspiring stories by women who channeled their passions into money-making products and services.